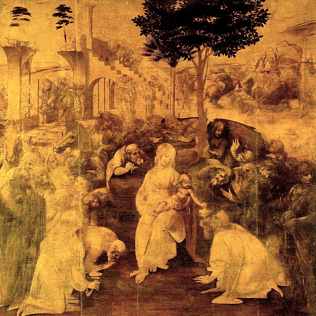 The Adoration of the Magi by Leonardo back to the Uffizi! The Adoration of the Magi, the famous incomplete painting by Leonardo da Vinci (1452 - 1519) will return to the Uffizi Gallery by spring 2017. The painting, an oil on canvas of almost square shape, has been at the Opificio delle Pietre Dure in Florence since 2011. Here, it underwent a major restoration, but finally the Leonardo\'s masterpiece is ready to return \"back home\". The Opificio restoration masters have worked to stop the deterioration of the colors in the work, which was in danger of becoming monochrome. During the five years of work, many tests were made on the state of the work, before cleaning it. The Adoration of the Magi will be the most important work of the exhibition \"Magic Cosmos: the Adoration of the Magi Restored\", which will be open from March 28 to September 24, 2017.